The kitchen is the heart of any home. Large, small, vintage, modern, it does not matter, it is the room with the most home soul. It sees a lot of foot traffic and serves a lot of purposes often making it messy and disorganized in the process. Clearing it out and making it work at maximum efficiency is easier than you think. 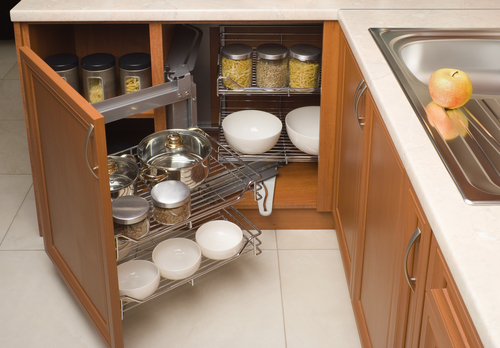 With our kitchen organization tips, you are hours away from the most organized kitchen in the neighborhood. Never underestimate the power of stacking. Saucers and cups can be stacked three high and it is a major space saver. You do not have to clutter your walls with calendars, cork-boards, or 100 post-it notes. Paint your pantry door or door to the outside in chalkboard paint and use it for family reminders, schedules, and dinner menu announcements. Cake stand. Cake stands are not just for cake anymore. Use one, or two, for holding salt & pepper, olive oils, herbs, butter, etc. It leaves a lot of open space underneath so you are maximizing counter space and making it pretty, too. Pot Rack. Pot racks are the best thing to happen to kitchens since the dishwasher. Use the wasted space above your head, on a wall, or even the back of a door. It will free up an entire cabinet; maybe even two. Hooks are the life's blood of a kitchen. They can hold any number of things on walls, but they are pure magic under the sink. You can use them to hold gloves, towels, scrub brushes, recycled bag holders, small cleaning tools, and work tools. Putting them on the interior walls of the under sink space leaves a lot of surface area available. Glasses take up a lot of space in cabinets. Try this neat trick: use a tray to divide glasses. Place glasses open side down on the shelf, then put the tray on top of those glasses and then put more glasses open side down on the tray. Do this with only glasses of the same size. It prevents glasses sticking together, as well. Now, we know you love them. Perhaps even adore them. Be reasonable, you need the space. Put those cookbooks that have not seen the light of day in 5 years out of the way. If you have high, unused space, put infrequently used cookbooks up high. It clears counter space and shelf space. Store spices in a drawer. If you have a long, wide drawer, use it for your spices. It is easier to keep them alphabetized and when in sight, in mind. Get a bar rack from the kitchen section and put it on a wall near food prep and cooking. This makes all your utensils easily accessible, frees up counter and drawer space for a few of the other things you will find at the certain Swedish discount store. While you are using some or all of these unique ideas, make sure to throw away anything expired, broken, or irreparably damaged. You can’t and shouldn’t be using it if it meets any of the above criteria. It may be overwhelming, but you can’t close your eyes and click your heels out of this one. Getting your kitchen organized can be done with some patience and perseverance. And, oh, how great it will feel when you are done! You will keep popping in to stare at your great work.